A Review- My Favorite Leafy Greens Recipe | I Can Run, So I Will! Take a quick look at Just A Taste‘s Raw Kale Salad with Warm Bacon Vinaigrette recipe. Maybe even print it out for later. Let me be honest. I had never had kale in my life until winter 2010, about two and a half years ago. I started out with Kale Chips. And I loved them. But now I’ve graduated to actually enjoying kale in its raw form. Behold- the Kale Salad. So many recipes and dressings. I’ve had a few and liked them. My stomach and digestive system really enjoyed some hearty and super healthy greens. Even WebMD claims Kale as one of the healthiest vegetables on the planet! Cant go wrong with that! I stumbled upon the recipe and listed among the ingredients were bacon (who can resist the B word? ), and pepitas, otherwise known as the pumpkin seed. These seeds pack some great nutrients. 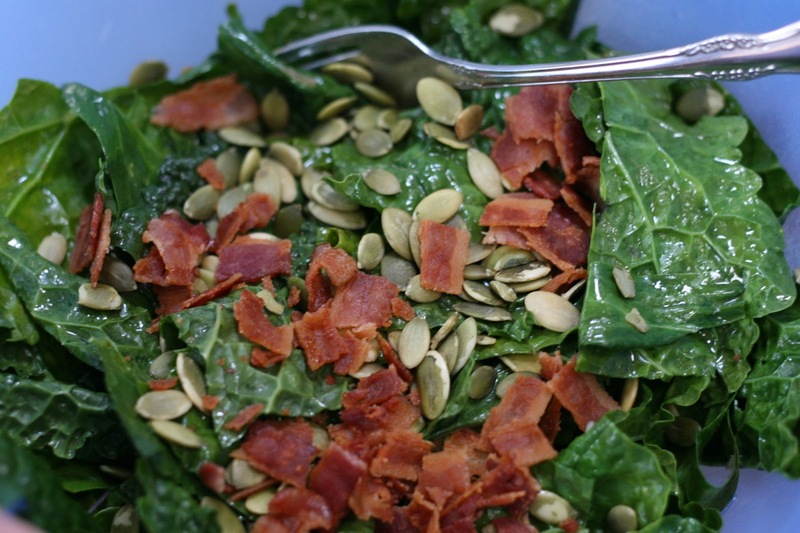 Kale + Bacon and Pepitas = I just HAD to try this recipe! I honestly wouldn’t change a thing. The punch from the mustard and apple cider vinegar in the dressing is amazing. And warming the kale just enough to turn them bright green is most ideal! After making this a couple times, I don’t need to look at my printed recipe any more. This is one of the few recipes that make it into my brain and stick there for when I’m craving an easy and delicious nutrient packed salad. Fuel your run! Eat some leafy greens!